Cootie Coo Creations: Candy Baskets: Start Getting Ready for Holiday Gift Giving! Candy Baskets: Start Getting Ready for Holiday Gift Giving! Start Getting Ready For Holiday Gift Giving: Do people actually work on holiday gifts in August? Well, yes, they do! 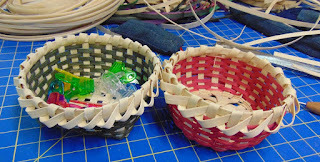 We will be making a pair of cut candy-dish type baskets. One has a square, cathead type base and the other has a round, double base. Both offer a choice of a variety of colors and a braided rim. Baskets can be either square or round, or one of each! Great, quick and easy baskets that make lovely gifts! Class fee is $40.00. All materials to make TWO baskets, use of tools and instructions are included in the price. Just wear comfortable clothes and bring a snack or bag lunch, bring or borrow an apron, and plan on having lots of laughs while you make a basket that is sure to bring loads of compliments. Class starts at 10:30 a.m. and may take until 3:30 p.m. or so. Seating is limited to 7 students each session, so sign up soon.